Dinner this evening was roast poussin. I’d picked up one each for Rob and I and they’ve been sitting in the fridge since I brought them home looking small, plump and delicious. Poussins are young chickens which are usually spatch-cocked or roasted whole and served one per person. They are tender and succulent with a delicate flavour. It seems wonderfully decadent, having a whole chicken to yourself, even if it is a very small one. 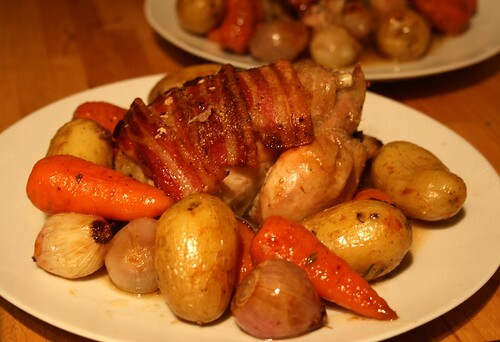 Add small, whole potatoes and carrots and you have a whole roast dinner all to yourself on one plate! Fabulous. Put slices of lemon and a few herbs, such as sprigs of thyme and rosemary, into the cavity of the poussins. 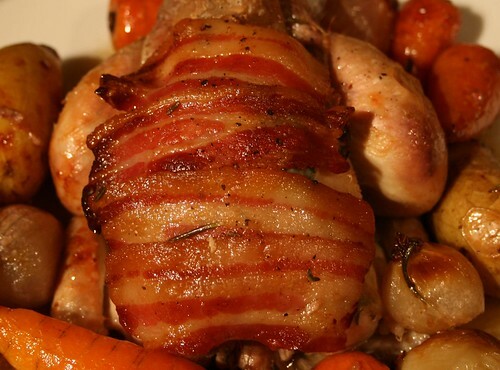 Go careful with the herbs – you don’t want to overpower the mild flavour of the poussins. Season the birds and place slices of streaky bacon over the breast. Parboil some new potatoes for about 5 minutes then put them in a roasting tray with the poussins along with some whole, peeled shallots and small carrots such as chantenay carrots. Pour a glass of white wine into the tray and drizzle some olive olive oil over the vegetables. Roast at 200c for 40-50 minutes until everything is cooked through and the poussin juices run clear. If the vegetables need a little longer remove the poussins from the tray and turn the heat up to finish the vegetables off. Just cover the poussins with foil to keep them warm. Make a gravy with the juices from the roasting tray by removing the excess fat and adding a little chicken stock. The flavour from the wine, shallots and lemon make this a delicious gravy. Previous Post Who Ate All The Grapes?